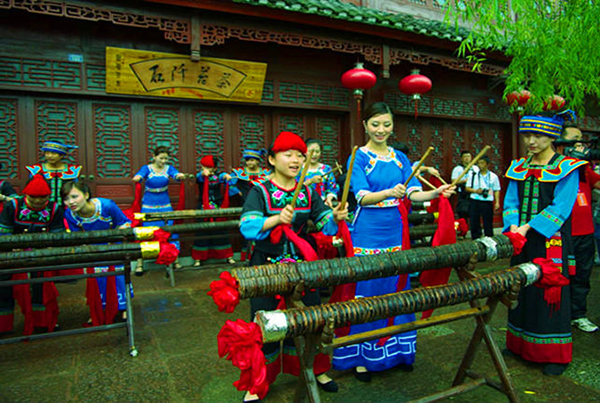 Guizhou Shiqian middle school is located in the town of Tangshan, near the Wenbi mountain ，Longchuan river . Three years of qing emperor guangxu (1877), in county magistrate Yang Xirui built the longchuan college on the Mingde college of the bottom of the Qifeng mountain of the west bank of longchuan river. After thirty years guangxu (1904)the abolition of the Imperial Examination , Longchuan college changed into the school.this is the source of Shi Qian secondary education. On March 5, 1934, Shi Qian junior middle school set up and had the first students.At that time,we called it Shi Qian middle school, and Lin Wanjie was the headmaster. In 1970,it changed into Guizhou middle school. In 2001,ending the Junior middle school,its name changed into Guizhou Shiqian Senior high school.Now,it is an entire high school. It has a long history and colourful culture.Since 1934,It has passed 79 years.Now,it is a Provincial model high school with the beautiful environment, the complete facilities,strong teacher strength,perfect system and sientific management. Now,it has 56 classes and over 3600 students.The teachers of the school are lofty and experienced.Their qualified rate is up to 100%.There are 8 postgradutes, 3 special-grade senior teacher,166 Intermediate and senior teachers and 38 Provincial, regional backbone teachers. (3) BA Degree or above (Education and Language degrees given top priority) preferred. Shiqian middle school has the complete facilities and favorable condition with one labrary of 120,000 books, three teaching bulidings, five students dormitories, one laboratory buliding and one office building. What’s more, it has built a modern indoor gymnasium and a plastic playground of 400 metres. All the teacher offices have the air-conditions and computers. All the classrooms have multi-media. Shiqian is located in the northeast of Guizhou Province, has unique geographical conditions, hot springs at the national level scenic spots in China, "township of the Chinese hot spring", "Chinese longevity village" and 14 "Guozihao" brand. "Here, you can stay away from the hustle and bustle of the city, leisure and health, indifferent and quiet. Here, you can fully see the mountains, could see the water, remember nostalgia life." Guizhou Shiqian County Deputy Secretary Zhou Di said.